Who's ready to have some fun today? We are! We are! When it comes to holiday season dressing, we realize that there's a bit of a duality that goes on here. Some people look forward to decking the halls in their Christmas jammies and keeping it as casual and waistband-flexible as possible. We totally get it... the struggle is real this time year. And then there are those that can't wait for their first holiday party, a reason to pull out their prettiest party duds and spiff it up in celebration of the season. While I was growing up my family favored the latter, and the tradition of getting all dressed up to celebrate the season and clink a glass or two with friends and family sort of stuck with me! So today, we're serving up some holiday party outfit inspiration that can carry you straight through to New Year's Eve... if unlike us you have the ability to stay up past 9pm on New Year's Eve. In that case you're a champion and we respect the hell out of you. This year we wanted to buck the traditional primary red, green and oh-so-sparkly holiday color palette in favor of some unexpected, but equally appropriate/awesome rich jewel tones for a fun twist on the holiday party outfit for him and her. There's just something so festive about bold, opulent jewel tones like teal, ruby red, purple, deep sapphire blue and gold, and we love letting that color palette find its way into our home decor and wardrobes during the holiday season. 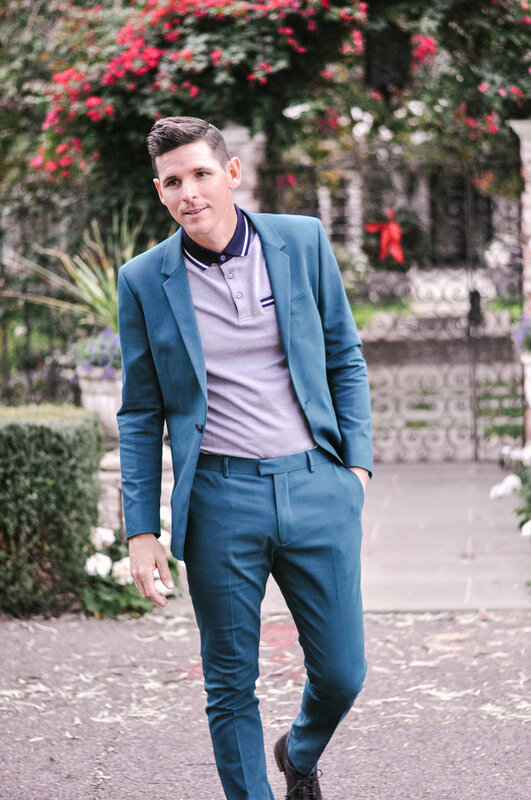 Chris' budget-friendly teal Topman suit may be one of my favorite outfits I've ever seen him wear, and I absolutely love the idea of pairing a slim suit like this one with a retro, buttoned-to-the-top pique polo shirt with slit pocket, instead of a more classic button down dress shirt. 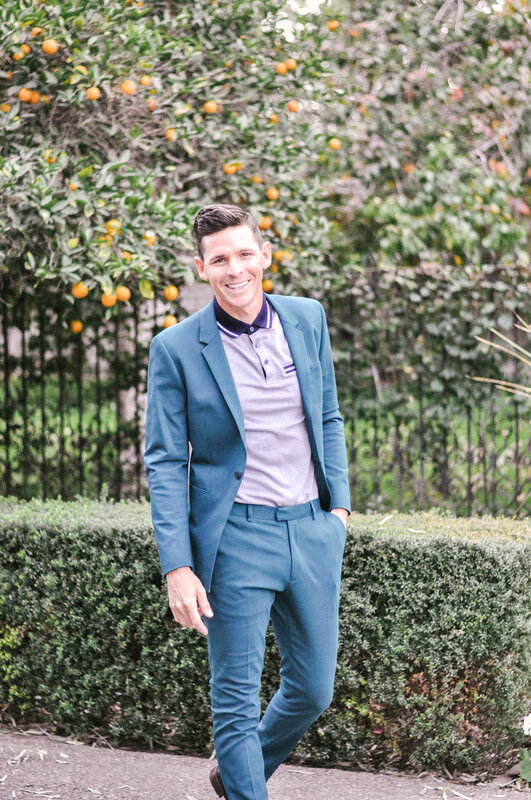 He wore the navy version here, but this Ted Baker beauty also comes in the perfect teal, too as well as some other fun color combos. The contrast tipping on the collar, placket and breast pocket, and the slimmer fit through the chest and waist give a nod to the classic tipped knit polo shirts that were popular back in the '60s, and the look is definitely making a modern comeback as of late, which we love. His suit may be slightly slimmer than some of you dudes out there are used to, and if that's you we encourage you to step outside your comfort zone and try something more form-fitting on the suit front in 2018 (we also love this one, this one and this one). No matter what your body type, a slightly slimmer fit will look super sharp on you and make you the envy of every guy at the office... or office party! We promise. 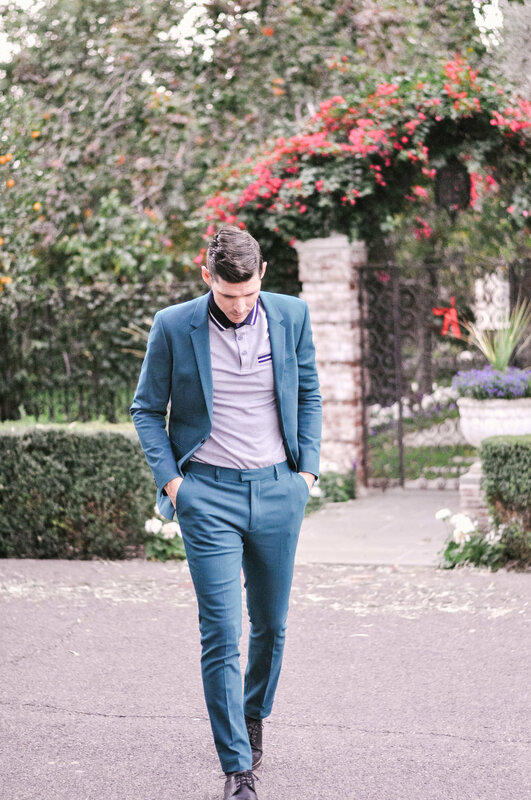 Chris has long enjoyed a slimmer pant, but it took him a few tries to really get comfortable in a slimmer suit cut. Now he loves it! And if it's any consolation, guys, trust me when I say that the ladies love it, too. They really love it. Speaking of trying new things, these budget-friendly purple wide pleat culottes that I'm wearing are definitely something new for me on the fashion front, but I was dying to try them after spotting them looking ah-maz-ing on the model on the ASOS website. Culottes are one of those women's fashion trends that I wasn't necessarily in love with when they first started to show up on the scene, but as the trend has evolved I've realized that they can be really fun and party-perfect if they 1. Are the right style - not all culottes are created equal in length and overall cut and 2. I can wear them with heels. Lots of women can pull off wearing culottes with flats, but I'm just not one of those women. Because of the wider cut and the ankle length, I need a little lift to lengthen this whole look. What I love most about these is that they're such a fun and bold alternative to a skirt or dress for a holiday party outfit, and in a flowy cut and pretty purple hue like this, they're just the ticket! 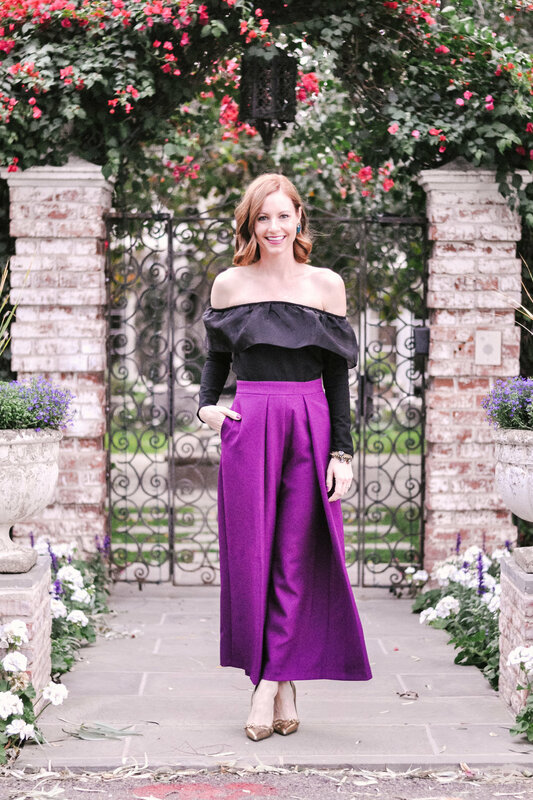 Because the purple culottes are pretty bold, I wanted to keep it simple with my top and this sweet black off-the-shoulder ruffle organza top from J.Crew is the perfect piece for that (it also comes in a beautiful emerald that I’m coveting). I also feel like I'll get a lot of wear out of this top because I can dress it up and pair it with a fun midi skirt or dressier pants this winter like I did here, or I can keep it casual with jeans and fun flats (like these gorgeous black stunners). So many options to play around with, which is what my wardrobe is all about these days. Versatility. Everything has to pull double duty in my closet, so this baby will fit right in! The shirt itself is also uber soft, stretchy and comfortable, so that's a holiday party bonus as far as I'm concerned! If you're into the holiday party pants idea as an alternative to a dress or skirt, I really love these, these and this adorable jumpsuit that would be so fun paired with a satin blazer like this one to keep you warm on these cold, cold nights! Or a velvet blazer like this one because... velvet. 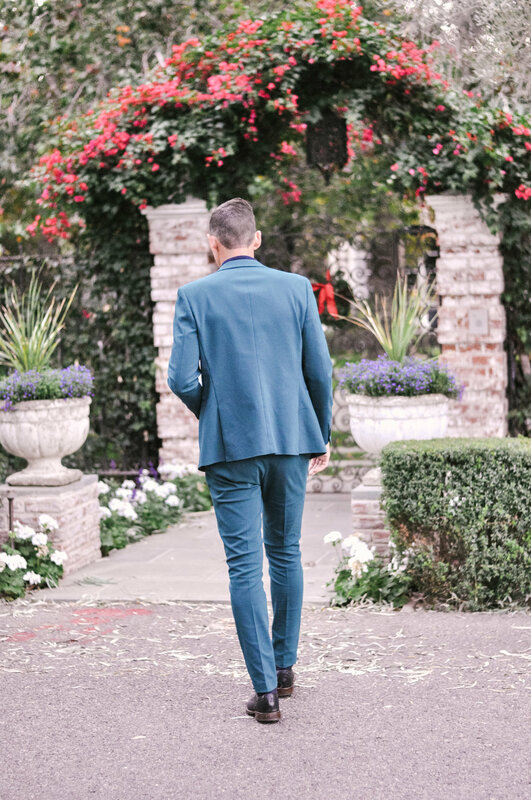 Speaking of velvet and as a random side note, I'm currently trying to figure out what holiday occasion I can wear this cool, budget friendly teal velvet jacket for. It's everything my winter apparel dreams are made of and more! These gold pointed-toe pumps with bows on the toes are Kate Spade and were purchased a couple of year ago, and I’ve gotten so much wear out of them! If you’re in the market for a nice, simple gold pump that you can pair with anything and everything this holiday season and beyond, I’m really loving these, these and these (I also love how simple and classic these are). My earrings are a fun, oversized pair of clip-ons that I scored at Forever 21 last year, but I've had my eye on these fun fanned earrings for a few weeks and they'd pair perfectly with this outfit or so many other holiday getups! In the widgets above and below you can shop our outfits, plus A bunch of other awesome holiday party outfit finds to keep you looking dapper and dressed to the nines all holiday season long. And if you’re looking for more winter outfit inspiration or holiday gift ideas, head over to the Shop page for all that and more!